There’s been a lot of chatter about the value of Halloween episodes in sitcoms this week, including some well-reviewed Halloween installments, but last year when I reviewed “Costume Contest” I noted that it was actually only the second Halloween episode The Office had ever done. While the series has often referenced Halloween in cold opens (like Pam as the only person at corporate in a costume, or the Warehouse haunted house), it shied away from episodes built entirely around the holiday, a decision that I’d argue reflects a confidence in the dynamism of the show’s basic situation (in that it doesn’t necessarily need holiday-themed plots to provide narrative interest). We’re reaching the point in the season, I think, where branding it as “lazy” is probably fair. I’ve suggested in the past that the show has created gaps in logic, and I’ve been flogged for ever suggesting that the show had any connection with reality and told that any complains I might have are misplaced. However, even if we agree to disagree on the question of realism, my concerns are reflective of a larger issue in which the care that goes into crafting the series just doesn’t seem as apparent on a weekly basis. When I suggest that the series needs more of a narrative, I’m not arguing that it requires complex storytelling. What I’m looking for is something that makes it feel like each episode is one day out of 365, one part of a larger story that goes on when we’re not watching. This season, however, everything has felt so manufactured that those gaps are more difficult to fill in, and attempts to add some degree of overarching narrative (like Pam and Angela’s pregnancy feud) have been enormously dull. Whatever humor there was to be found in this episode, none of it felt connected to anything that wasn’t specific to this episode, suggesting that the situation at the heart of the show is no longer responsible for generating humor on its own. Their decision to rely on Halloween yet again is certainly part of this argument I’m forming, even though I actually thought “Spooked” was a decent take on the holiday. The episode benefitted from the focus on Erin instead of Andy, and by its willingness to allow Robert California more time to interact with the office at large. No, I’m not convinced that I care about whether or not those crazy kids (Erin and Andy) get together in the end, and I still think that it doesn’t make any sense for Robert California to fly his son to Scranton to attend a Halloween party if he’s supposed to be based out of Florida, but I was generally satisfied with the way these two stories played out within the context of the episode. In the case of Erin, this is probably the sweet spot in terms of the character’s intelligence level. I’ve always loved Ellie Kemper’s commitment to the role, but the character she’s been asked to commit to has been more uneven, so it was nice to see Erin allowed to function a fairly normal human being for a change. Erin’s “innocence” has been a valuable part of her character, and so her child-like Halloween party perfectly fits her child-like nature (which is fine when removed from discussions of “intelligence” and shifted instead to discussions of maturity). 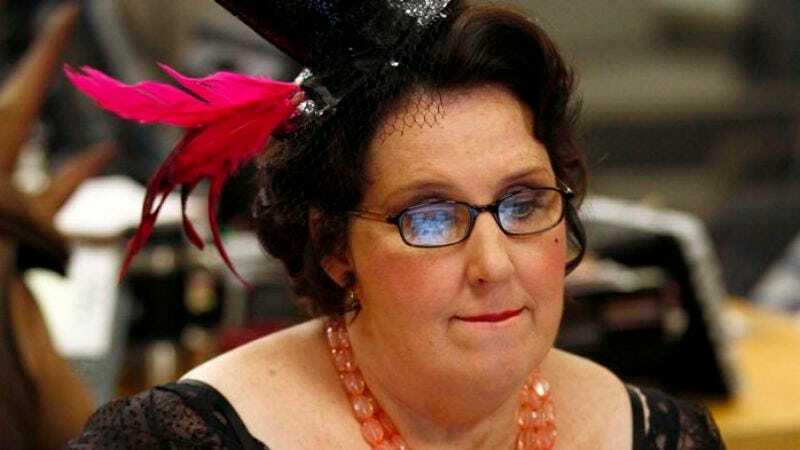 It wasn’t particularly funny, but her insecurity about how Andy’s attempts to change the party reflected her standing with him was really quite heartbreaking, and highlighting their unique relationship helped differentiate this at least a little bit from how this story would have played out with Michael (which was, as it has been all season, too easy to imagine). As noted above, I’m actually not convinced I care whether Andy and Erin are a couple, which could become more problematic as the show focuses more energy in that area. However, here it was just a sweet little story about Erin’s struggle to impress Andy by being something she’s not, backing herself into a corner (with the help of Gabe’s cinema of the grotesque) and resulting in a nice note for the character and a strong episode for Kemper. The rest of the episode was more loosely constructed, and I didn’t particularly respond to any of it. I don’t care that Pam believes in ghosts and Jim doesn’t, I don’t care that Dwight gets a few scenes in which the cynical adult is softened by the presence of a precocious child, and I don’t particularly care what each of the employees are most afraid of. However, I love that Robert California does with all of this. The show has positioned the character as a man who treats his employees as test subjects, and is obsessed with performing social experiments every time he is in their presence. Watching “Spooked,” I realized that this season would be far more interesting if it was told from Robert California’s perspective, or at least gave us a more substantial view into his perspective on these characters. For us, there’s nothing new going on with these characters, which has been one of the season’s largest problems. For Robert, however, all of this is sort of new, so to see him delight in playing with their heads is far more entertaining if only in terms of novelty; it is, after all, just about the only “new” storyline the show has managed all season (especially with the Erin/Andy relationship being revisited). His little story isn’t particularly funny, or particularly scary, but the threading together of his various interactions and that wry little smile he gives the camera a few minutes before he begins carry a narrative pleasure that still holds value. Wouldn’t it hold more value, though, if the season was more interested in exploring it, or if “Spooked” didn’t end with a cloying voiceover about lessons learned? I did not actively dislike this episode, perhaps because Halloween is such an easy concept to deploy in the show’s current form, but it did nothing to suggest that The Office is still trying. There is novelty in costumes, and there is novelty in Robert California, but I remain stubborn in my belief that there has to be something more than novelty, especially when the show’s idea of “novel” is largely built on rehashing storylines and tropes from previous seasons. 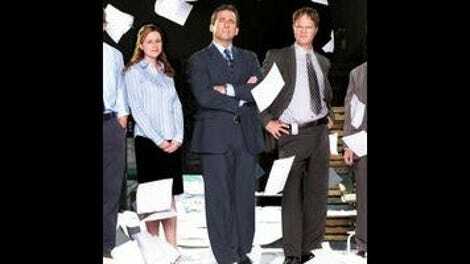 This episode wasn’t terrible enough to call it a failure, but it wasn’t funny enough to justify its lazy construction, which has unfortunately become the standard for The Office this season. Help me out—there were no credits on the screener, so I couldn’t check myself, but where do I know that child actor from? It was driving me crazy throughout the episode. It was far from funny, but I like the writers’ belief that the very idea of Darryl, Kevin, and Jim dressing up as the infamous Bosh/Wade/James trio from the Miami Heat is supposed to be embarrassing. Let’s ignore that they never said why they were dressing up as them, or why a perfectly reasonable person like Darryl would do such a thing (we only get Jim’s justification), but I was entertained that the writers thought people would inherently get the joke. I’m not convinced they would, although I may be underestimating the popularization of the anti-fandom surrounding the trio. This week in “Ideas From Before Steve Carell Left That We Repurposed Because We’re Too Lazy to Write Storylines Specifically for Andy”: that entire costume selection sequence in the (decent) cold open, in particular his reaction to Phyllis’ proposed costume. That more or less goes for the whole episode too, really, except swap out “quasi-paternal” for “quasi-romantic” in terms of his relationship with Erin. I didn’t think any of the costumes were particularly memorable this season, but perhaps you folks responded to them more than I did? Have a favorite?